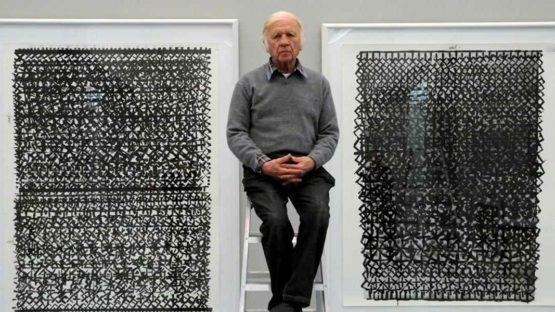 Heinz Mack is a German painter and sculptor associated with Op Art, Light Art, and Kinetic Art, and co-founder of the ZERO movement. Born in 1931 in Lollar, Mack studied painting at the Düsseldorf Academy between 1950 and 1953, and earned a degree in philosophy from Cologne University in 1956. The central theme of Heinz Mack’s art is light. Sculptures and pictures are the media of his multifaceted oeuvre. The exceptionally diverse complete works include sculptures made of different materials: light-stelae, light-rotors, light-reliefs and light-cubes. His oeuvre also involves paintings, drawings, India ink, pastels, graphics, photography and bibliophilic works. Another important aspect of Mack’s work is the design of public spaces, church interiors, stage settings and mosaics. His style evolved throughout the 1950s, and he experimented with a number of different techniques and media. Influenced early on by the non-geometric abstract art style known as tachisme, Mack worked as an art teacher and independent artist, creating a series of monochrome paintings comprised of ridged, parallel lines. In 1958, he produced his first light reliefs and light cubes in polished aluminum. He then expanded on this work, creating a series of motorized reliefs with rotating elements, and light columns. In 1957, he had his first solo exhibition in Düsseldorf, and, along with fellow artist Otto Piene, founded the ZERO group. Sometimes linked to Nouveau Réalisme, this movement, whose name was meant to highlight its affinity with Minimalism, emphasized discovery by promoting artistic creation unconstrained by tradition, calling for the use of simple forms and pure colors and light. Heinz Mack lives and works in Mönchengladbach and Ibiza.